for the anniversary celebration of St. Anne’s Episcopal Church. While she was here she spoke at a clergy forum (which I was unable to attend). At some point during her visit, the Tennessean covered some of her comments about the theology of marriage as presented in the Book of Common Prayer. According to the report, she stated that the primary end of marriage as presented within the BCP is companionship (of course, the fact that the BCP states that Christian marriage consists of the union of a man and a woman was conveniently overlooked), and not a remedy against sin. While it is true that the 1979 BCP removes the notion of marriage as a remedy against sin from the text of the preamble, I would argue that it is wrong to read the BCP outside the context of its predecessors. Indeed, what is interesting–given the strong criticisms some conservatives have of the 1979 BCP–is that the preamble to the marriage service in the 1979 is actually a fuller description of Christian marriage than is the one in the beloved 1928 Book of Common Prayer, and it hearkens back even more to the marriage service of the 1662 English Book of Common Prayer. While it’s a shame neither those married with the 1928 or 1979 heard the phrase “like brute beasts that have no understanding,” at least the 1979 makes reference to the “purposes for which it was instituted by God,” that is, the purposes mentioned previously as well, I would argue, as the traditional ends of marriage as explicated in the history of Christian theology. Thirdly, It was ordained for the mutual society, help, and comfort, that the one ought to have of the other, both in prosperity and adversity. Into which holy estate these two persons present come now to be joined. Therefore if any man can shew any just cause, why they may not lawfully be joined together, let him now speak, or else hereafter for ever hold his peace. Dearly beloved, we are gathered together here in the sight of God, and in the face of this company, to join together this Man and this Woman in holy Matrimony; which is an honourable estate, instituted of God, signifying unto us the mystical union that is betwixt Christ and his Church: which holy estate Christ adorned and beautified with his presence and first miracle that he wrought in Cana of Galilee, and is commended of Saint Paul to be honourable among all men: and therefore is not by any to be entered into unadvisedly or lightly; but reverently, discreetly, advisedly, soberly, and in the fear of God. Into this holy estate these two persons present come now to be joined. If any man can show just cause, why they may not lawfully be joined together, let him now speak, or else hereafter for ever hold his peace. Dearly beloved: We have come together in the presence of God to witness and bless the joining together of this man and this woman in Holy Matrimony. The bond and covenant of marriage was established by God in creation, and our Lord Jesus Christ adorned this manner of life by his presence and first miracle at a wedding in Cana of Galilee. It signifies to us the mystery of the union between Christ and his Church, and Holy Scripture commends it to be honored among all people.The union of husband and wife in heart, body, and mind is intended by God for their mutual joy; for the help and comfort given one another in prosperity and adversity; and, when it is God’s will, for the procreation of children and their nurture in the knowledge and love of the Lord. Therefore marriage is not to be entered into unadvisedly or lightly, but reverently, deliberately, and in accordance with the purposes for which it was instituted by God. Just reported out of Mumbai: the hostages at the Chabad center are dead. Moshe Holtzberg, the two year old son of the rabbi and his wife, a child who escaped with the center’s cook, is now an orphan. Thanks, Muslim terrorists! You do so much for the world. Your Mumbai adventures on behalf of your faith have killed scores of people, and have jacked up tensions between two nuclear powers that hate each other. And now there are reports that British nationals of Pakistani origin may be involved in the attack — something that, if true, could make life very difficult for Brit-Paks. R.R. Reno interviews Joseph Bottom on "The Death of Protestant America"
UPDATE: The dialogue is now up on Covenant. Note: The following is my contribution to an ongoing dialogue among the Covenant Communion authors regarding Women’s Ordination–specifically the vote of the Church of England’s General Synod to allow women Bishops.Â Some might well ask why the vote in England has attracted so much attention, after all there are plenty of Churches within the Communion who ordain female priests (and once women were admitted to the Presbyterate it was only a matter of time before they were admitted to the Episcopate–it became a fait accompli at that point)Â Not only that, but a majority of provinces now allow for women’s ordination to the Diaconate.Â So all the fuss might seem a little strange, lot least to Episcopalians who have moved in a universe where women have been ordained as Priests since the 1970’s and to the Episcopate not long thereafter.Â Yet, this *is* a big deal, at least ecumenically because–for example–it has a dramatic impact ecumenically that the decisions to ordain women priests and consecrate women bishops in say, the US or New Zealand did not have.Â This impact is related to the fact that the Church of England, as the mother church of the Anglican Communion as a whole, has been seen as the “bell weather” church for the whole communion, especially by Rome.Â Some have suggested that this particular concern for the Church of England on the part of the Roman Catholic Church has had a lot to do with the perception in Rome of the Church of England as a wayward province of the Western Catholic Church, and therefore one that could concievably be brought back–whole and entire–into union with the Holy See.Â Hence the fact that the Roman Catholic Church in England was very careful not to reproduce sees (the head of the RCC in England is the Archbishop of Westminster, not the “Roman Catholic Archbishop of Canterbury”, for example).Â Whatever the underlying reasons are, the Roman Catholic Church (and to a lesser extent the Orthodox) have always taken more heed of what the Church of England has done, noting that until something is done in England the question cannot be said to be settled, and if it is done in England it is a foregone conclusion elsewhere.Â So all of this led to a discussion among us of the General Synod vote, women’s ordination as well as the notion of a “process of reception” for changes in practice within the Communion.Â I am addressing some particular objections to the idea of a process of reception in the comment below.Â The whole dialogue will be posted on Covenant shortly and I hope you all will take time to read it when it is up. I have a few thoughts I would like to add to the discussion regarding reception and the questions raised by Sam above.Â Any discussion of women’s ordination, particularly the ordination of women to the episcopate would seem to be incomplete without some reflection on how the issue of reception can be seen in the evolution of the episcopacy in general.Â (Of course part of the issue that has to be raised is whether or not one believes there was a time when the ministry of Bishops, strictly speaking, did not recognizably conform to our contemporary expectations, i.e. one has to allow that there were a diversity of practices locally that eventually developed and coalesced into the three orders of ministry with the mono-episcopate that we recognize today.Â Once one has answered that question allowing for development, the next question is whether such development was guided by the Holy Spirit or not. I agree with those who assert that the biblical record is clear that there was no single definitive way of organizing the early Christian communities that arose from the missionary activities of the Apostles and other disciples but that it emerged and became uniform over the first two centuries especially.Â Indeed, the only Church that is spoken of in the New Testament as being under the authority of a single residential leader is the Church of Jerusalem of which James was the single episcopos, perhaps serving as a model upon which later individual episcopacies would be founded (this observation connects, I believe, with +Rowan Williams’ recent observation in his paper–read in his absence–to the Society of St. Alban and St. Sergius, that, with the exception of Jerusalem, all churches are daughter Churches).Â In the case of other local churches, it seems that the situation was rather more diverse.Â In some instances it appears as though there was indeed a single overseer for the entire community, while in others it appearsÂ as though councils–alternatively referred to collectively either as councils of presbeuteroi or episcopoi–exercised as a collective the authority that would later be ascribed to one of their number as Bishop.Â Largely this distinction seems to have been geographic in nature, with the eastern churches developing the episcopate as we now understand it at an earlier date (understandable given their closer proximity to the Mother Church in Jerusalem). In his book, From Apostles to Bishops: The Development of the Episcopacy in the Early Church, Francis A. Sullivan, S.J. argues persuasively that there were differences in the authority structures of local churches.Â Specifically he maintains the the mono-episcopate seems to have developed earlier in the churches of the east (think Syria-Palestine and Ignatius).Â On the other hand, in comparing the letters of Ignatius and Clement, he shows that the episcopal authority at Corinth in Clement’s day (and, he argues, in Rome as well) seems to have been held collegially by a council of elders, in contrast to, at the risk of using a biased term, the more developed episcopacy evidenced in Ignatius’ writing. In Iraq the â€œsurgeâ€ is working, but at the same time the Iraqi Christian community is dying. Hardly anyone seems to know, and those who know donâ€™t seem to care. In former times, the violent persecution of Christians in a country effectively under the rule of a Western, Christian power would have been unthinkable. But not, it seems, in the enlightened 21st century. The names may be complicated. The facts are not. The Chaldo-Assyrians constitute what remains of the original, non-Arab, population of the area. Iraqâ€™s principal Christian communities today belong to the Chaldean (Catholic) Church, Syrian Orthodox Church, and the Assyrian Church of the East. All use Aramaic, the language spoken by Christ. Despite successive persecutions and constant pressures, Christianity has continued in Iraq since, according to tradition, it was brought there by St. Thomas the Apostle. But Christianity now faces extinction. The 1987 census recorded 1.4 million Christians in Iraq. Numbers began to drop as conditions deteriorated after the first Gulf War. There were, though, around 800,000 at the time of the U.S-led invasion of 2003. Of these, about half have now left the country altogether, while more than 100,000 are internally displaced persons. There is no mystery as to why. With other (still smaller) religious minorities, such as Yazidis and Mandaeans, Iraqâ€™s Christians are suffering sustained persecution. While constituting less than 4 percent of the population of Iraq, Christians constitute 40 percent of the refugees leaving the country. Most of these have found refuge in Syria and Jordan, where they are living in utterly degrading conditions. The current rate of Christian exodus is estimated at about 2,000 a day. Members of all religions have been affected by the violence since the toppling of Saddam Hussein. But Christians are in a worse position since they suffer directly because of their Christian faith. Targeted by Islamist extremists, they are confronted by demands to convert, death threats, looting of their homes and businesses, systematic intimidation, abductions for ransom, bombings, and frequently murder. Because Christians are known to be weak they and their property are also prey to gangsterism. Churches and church leaders are particular targets for Islamists. The 65-year-old Chaldean archbishop Paulos Faraj Rahho of Mosul was abducted and murdered in March. Numerous priests and deacons have been tortured and shot or beheaded. At least 40 churches have been burnt. When I was in college, Starbucks was the devil. They were considered evil by the hippigensia that pervaded my university (which I love by the way) because they worked against the little guys at home and abroad. In the US they moved into areas and put independent coffee shops out of business, or at least made their lives harder. Overseas their lack of care in purchasing their beans meant laborers were mistreated. 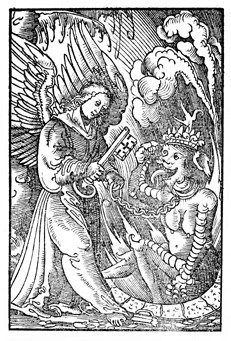 So, by extension, Starbucks was the devil. Eventually the hatred died down as Starbucks worked on cleaning up their image by offering benefits to their employees at home and buying at least partially into the fair trade movement. Now in 2008, Starbucks is trying to turn their flagging business around in an economy where folks are cutting the fat. And Starbucks is nearly all fat. As part of their plan to turn things around they’ve launched a new line of Coffee that hearkens back to their roots in Seattle’s Pike Place. In addition to the throwback coffee, they’ve added a throwback design. But now the BBC is reporting that some Christians (belonging to a group calling themselves “the Resistance”) are up in arms over the “new” Starbucks logo (see comparison at right) and are calling for a boycott of the Coffee giant. Excuse my lack of righteous indignation, but I like the new logo better. If you’re going to use a representation of a mythological creature for your logo you ought to have the gumption to depict it in a similar way to the original. 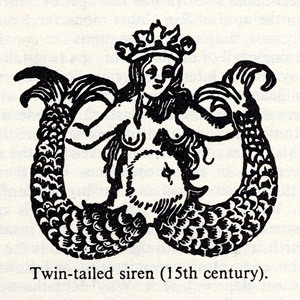 In this case, the Starbucks logo is reportedly based upon a “16th century Norse design” of a siren. Am I wrong? Should I really be offended by this? Parents, would you cover your children’s eyes when passing this sign? To paraphrase a commenter on another site, this is horrible… if we don’t get rid of this logo all the Christian children (and husbands) are going to go straight down to the fish market and debauch themselves. And, for a very interesting history of the Starbucks Logo, check out this site. I have been somewhat critical of the stance of some in the global south that they will boycott Lambeth. In a way, it seems almost like snatching defeat from the jaws of victory. However, despite my criticisms, I think some very real spiritual concerns underly these statements. And I agree with them–we really need to deal with these issues before Lambeth, so that it can be a fruitful conference. How can we restore communion before hand? Obviously I think repentance is needed all around, but I think this is especially the case for those of us in the Episcopal Church. We acted arrogantly and self-righteously and the rest of these events have unfolded as a result of what we have done–and we can’t say we weren’t warned. People forget that Akinola was one of the harshest critics of Archbishops Yong and Kolini when they formed the AMiA–the actions of the American Episcopal Church persuaded him that intervention was a justified option. Archbishop Akinola, so demonized in the west, has written a good summary of his thinking on the current issues in the Guardian. Like a joke, they thought that as Africans, we don’t know what we are doing; particularly, the Americans and you know they always have their ways politically and economically. So, we have been dragging it since 1998 and Africans and some of our other colleagues in America, England and South Asian, we have maintained our stand that we will not continue with any of our church that ignore what the bible says. We have had several conferences and several meetings, attended several commissions to see how we could reconcile the western people with the so-called conservatives, all to no avail. In fact when America tried to ordain a practising homosexual as bishop, many conservatives broke communion with them. So today, we are in a state of a broken communion in the Anglican Church wordwide. This is critical and fundamental because when we say we are in a state of a broken communion, it means that the other group has been ex-communicated as it were or orstracised and you are not in fellowship with them anymore until that communion is restored. In Lambeth Palace, we met as Primates, we could not share in the Lord’s Supper. It is as that bad. As Primates and Archbishops, we could not share in the Lord’s Supper – the highest and most important service in our church. So, what is left of the church then? It happened in two other places like that again and again, because the faith once delivered to the saints has been abandoned as far as we are concerned. All we are saying is that, look you don’t have a monopoly of homosexuals in your community. They are in Africa, they are in Abuja here and everywhere, but we don’t celebrate it for God’s sake. Our duty is to counsel people that are involve in it. To pray with them guide and advise them until they will come back to their senses. Many who have this problem have been healed world over. It is an acquired syndrome. But they say no, it is not an acquired syndrome, it is the way they are made. But we say no to that. God did not make a mistake in creation. God did not make a mistake in creating a man and a woman and they cannot re-create what God has already created. So, when our brother, Rowan Williams, a man I admire so much, a man I respect so much for his intellectual ability, spirituality – and he knows that I love and respect him a great deal- but when it comes to this, his position is baffling and we cannot sweep it under the carpet. Communion must be restored first. We cannot go to Lambeth Conference to go and restore communion. We must do this before we can meet at the Lord’s table.